Mary Spring Rice and Molly Childers on board the Asgard holding arms from Germany which were successfully landed in Howth Harbour, July 26, 1914. Irish women played a key role during Easter week 1916 but it’s largely been forgotten. Pádraig Pearse stands on the steps of the G.P.O. on Easter Monday, 1916, the Proclamation of the Irish Republic in his hands. “Irish men and Irish women,” he begins. Fighting words at a time when, in both Britain and the U.S., women demonstrating for the right to vote were being run down by police horses, beaten, and jailed. So, why is this manifesto in its commitment to women’s equality so ahead of its time? Because Pearse and the other leaders knew that no revolution in history ever depended so heavily on women. Inghinidhe na hÉireann was the first Irish revolutionary group to work openly in defiance of the British government by holding public meetings. They organized Irish language and history classes and school dinners for the children of poverty-stricken families. They also accosted British Army recruiting officers on O’Connell Street, tried to dissuade Irish men from enlisting, and discouraged Irish women from dating English solders. Gonne, who was of Anglo-Irish stock, had been won over to the nationalist side when she witnessed evictions during the Land Wars. She began agitating for home rule, and in 1898, using the centenary of the 1798 rebellion to fan the flames of revolt, she traveled the dark lanes into bleak villages to rouse the dispirited Irish. Her companions were Ethna Carbery, a journalist and poet who wrote the rebel song, “Roddy McCorley,” and taught it to the crowds, and Alice Milligan, a nationalist who had founded branches of the Irish Women’s Association in Belfast and other places. The Gore-Booth sisters, Constance and Eva, born into Ireland’s Protestant gentry, were also shaken out of the aristocratic lifestyle by the needs of the disenfranchised peasantry. Constance, as Minister for Labour in the Irish Government, became the first woman to hold such a post in Europe. But it’s as a commander of the combat unit at St. Stephen’s Green that she captures our imagination, dressed in her uniform of the Irish Citizens Army, pistol in hand. Margaret Skinner who served as a scout, a courier, and a sniper during the Rising. Shot and wounded, she was refused a military pension on the basis that she was a woman. Let us also name those other women elected to the Dáil in 1921 at a time when the British General McCready proposed arresting all the T.D.s and shooting them. 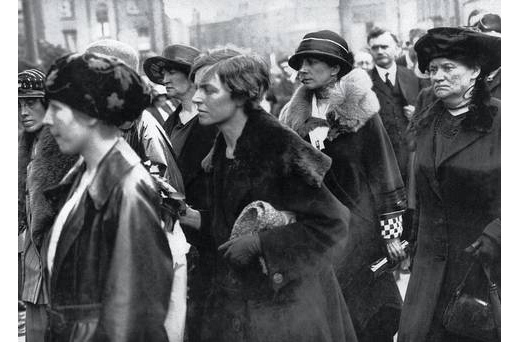 Kathleen Daly Clarke, who operated a successful business in Brooklyn until she and her husband, Tom, returned to Ireland to take part in the struggle. Both he and her brother were executed in 1916. Mary MacSwiney was a Cambridge graduate, whose brother Terence MacSwiney died on hunger strike. Kathleen O’Callaghan, a successful businesswoman, saw her husband, the Mayor of Limerick, shot dead in their hallway. Ada English was one of the first women psychiatrists in Europe. 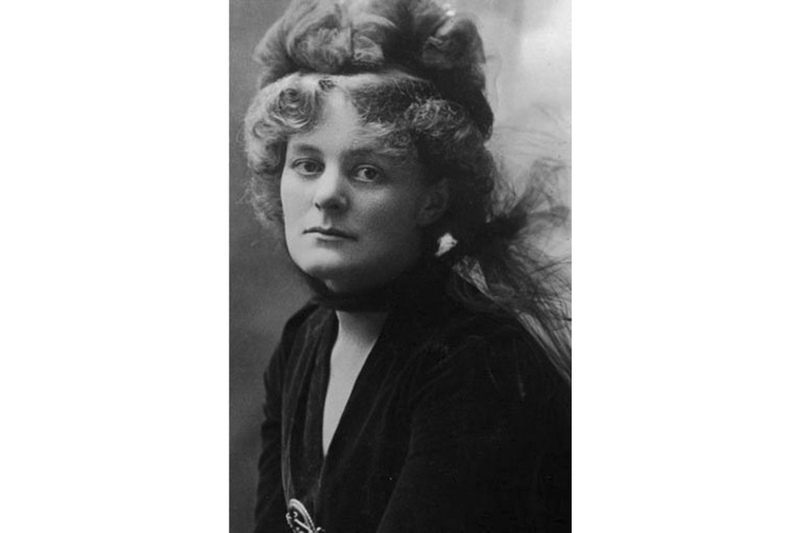 And then there was Margaret Brady Pearse – a native Irish speaker, it was she and her Aunt Margaret who connected Pádraig Pearse to his Irish heritage. 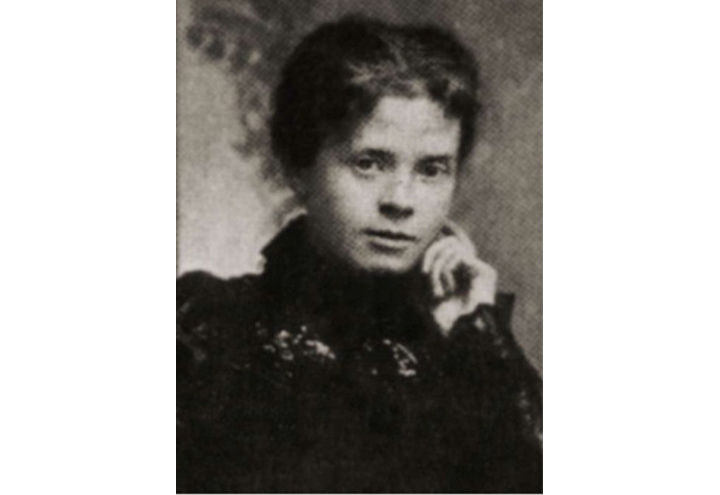 And let’s not forget Molly Osgood Childers of Boston, the wife of Erskine Childers, who managed to be both a British Naval Officer and an Irish revolutionary. Though crippled in a childhood accident, Molly strapped herself into the Asgard, the yacht that had been a wedding present from her father, and sailed a shipment of 900 rifles, complete with ammunition, through a British Naval blockade to deliver them to the Irish volunteers at Howth in 1914 – arms that went on to be used in the Rising. Molly was joined onboard by her friend Mary Spring Rice, who like the Gore-Booths, was a member of an aristocratic English family. Her brother was the British Ambassador to the U.S. But, while the role played by Gonne, Childers, and the Gore-Booth sisters in the rebellion is well known, it’s to the a brave, unassuming cadre of “ordinary,” but extraordinary, Irish rebel women – women who have been almost totally overlooked in the history of the struggles – that we owe a great debt of gratitude for their part in Easter Week. 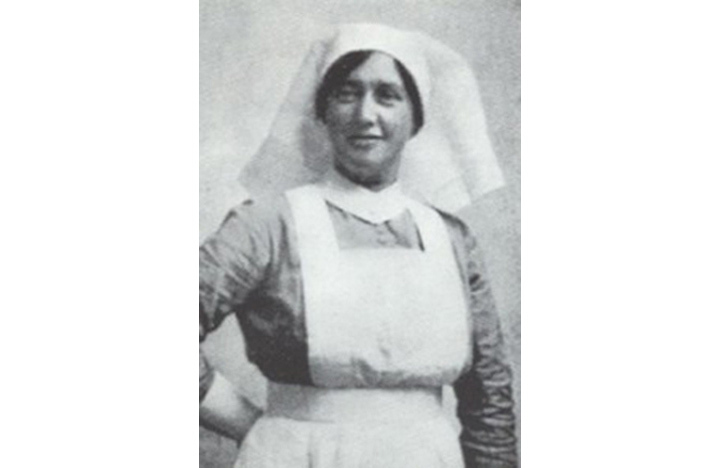 Elizabeth O’Farrell, who nursed the wounded in the G.P.O. and was chosen by Pádraig Pearse to deliver the notice of intent to surrender to the British authorities. Cumann na mBan (the Irish Women’s Council) had an active part in the Rising. Formed in Dublin in 1914 to aid the Irish Volunteers, branches quickly spread out around the country and eventually absorbed Inghinidhe na hÉireann. The women of the Irish Citizen Army, formed by James Connolly following the Lockout strike of 1913, also took part. 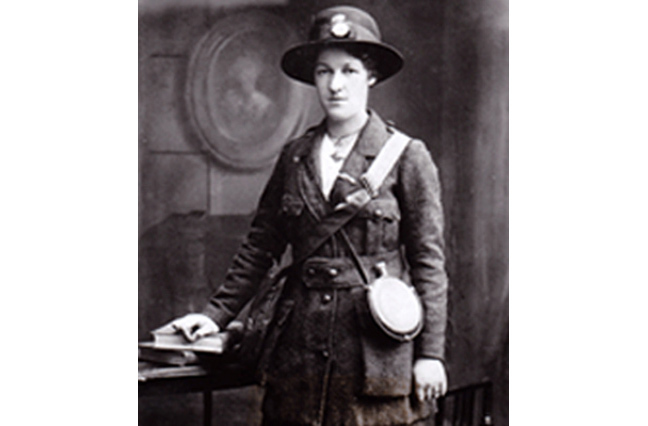 When the first shots of the Easter Rising were fired at Dublin Castle, Helena Molony was there with a party of nine girls from the Citizen Army. Under the command of John Connolly, they took over City Hall. Cumann na mBan women at Cathal Brugha’s funeral. Mary MacSwiney is on the far right. The next day, O’Farrell stood at Pearse’s side as he surrendered. Seventy-seven women were taken prisoner after the Rising and spent time in Kilmainham Gaol where the conditions were appalling. From 1916 through 1923, during the War of Independence and the Civil War, 600 Irish women involved in the fighting were incarcerated. Yet, their struggle went largely unrecognized, and underappreciated. In photographs of Pearse’s surrender, O’Farrell was airbrushed out, only her feet can be seen. It was a harbinger of things to come. When the Irish Army military Archives were released in 2014, it was revealed that over 200 members of Cumann na mBan had applied for pensions based on their military service during the 1916 Rising and the War of Independence. Some of them like Margaret Skinner, who acted as a courier, a scout, and a sniper, were wounded multiple times. All were refused pensions solely on the basis that they were not male. Some, including Skinner, persisted, and in the late 1930s received pensions. Most did not. Alice Milligan, poet and writer, who was active in the Gaelic League. De Valera, who emerged as the leader of the new Irish state, aligned himself with the Catholic Church and the 1937 Constitution, of which he was the chief architect, reflected this special relationship, with its reference that women “not be obliged to engage in labour to the neglect of their duties in the home.” Or, as Archbishop of Dublin, John Charles McQuaid put it, “Nothing will change in law and fact of nature that woman’s natural sphere is the home.” These changes in the constitution enabled discrimination against women in the coming years, and up until the late 1970s, women in teaching and the civil service were obliged to resign from their positions when they married. But as women became more active in the workforce they caused some of the old mores to shift. This was reflected in the 1990 election of Mary Robinson as President of Ireland – the first female to hold the office. Another woman, Mary McAleese would follow Robinson’s reign. Women in Northern Ireland have also made strides in recent times. Arlene Foster just become First Minister, the first female to hold the position. Meanwhile in New York, two of Ireland’s leading women were center stage at the kickoff of the 1916 centenary commemorations, Anne Anderson, Ireland’s first female ambassador to the U.S., and New York’s Irish Consul General, Barbara Jones. In another groundbreaking event in Irish America this coming March, Ambassador Anderson will be the first woman keynote speaker at the annual Friendly Sons of St. Patrick dinner in Philadelphia. Mary Pat Kelly is the author of numerous books, including the bestselling novel Galway Bay, an epic family saga set in 19th-century Ireland and Chicago, and the recently-published Of Irish Blood (Forge). Hi, can I just point out that it is Margaret Skinnider not Margaret Skinner and that her contribution to Irish education and teaching goes far beyond what she was doing in 1916. She was a truly remarkable woman if you look at her activities post 1916.